Here's the link to MRRA's submission. (19/6/17 - P) It's outrageous, sneaky and unacceptable. The “Draft Framework Plan – Kyneton South Investigation Area, May 2017” takes growth for Kyneton way, waaay past what the Shire's Settlement Strategy says, and silently balloons the town's boundary out towards Malmsbury and north towards the airfield. Haven't been told? Not what you want for Kyneton? Make a submission. The Framework Plan is “investigating” Farming and Low Density Residential zoned land south of the river for new residential development - all the way to Pleasant Hill Road on the east and Springhill Road on the west - supposedly to accommodate growth out to 2036. There's 310 ha of land under "investigation", which is almost 45% of the area counted as Kyneton township in the 2011 census. It's additional to the controversial 341 lot development plan south of the river approved without community consultation in 2015, and it's additional to Amendment C110's planned conversion of 265ha (mostly Farming zone) into 2ha lots. Most of the Framework Plan's "investigation" area is outside the Kyneton town boundary. That boundary changed last Thursday when the Minister for Planning approved Amendment C99. * In C99, the previous council – without asking or telling residents – changed Kyneton’s town boundary, adding 35ha north of the industrial area, and rearranging the boundary in the south to – wait – better define Kyneton’s "outer suburbs”. The Framework Plan shows a vastly expanded town boundary for Kyneton, which no-one has been told about, adding yet another 350ha of rural land inside the boundary, and additional to all of the above. Click here for maps showing pre-C99 town boundary, the boundary approved in Amendment C99, and the Kyneton South Framework Plan's town boundary. Together, C99 boundary changes, Amendment C110's 2 ha lots, the Kyneton South investigation area and the expanded Framework boundary pretty much double the size of Kyneton. Who's driving it, and why, when the town has sufficient existing land to accommodate growth out to 2036? Why are our rates being wasted on something that's not needed? Make a submission by June 23 (doesn't have to be long) registering your concern/objection. Tell the new council (all councillors, please) this has to be stopped. This “Plan” has missed a step – it isn't asking if this is the Kyneton that residents want, it's planning for how accelerated growth will happen, and expanding the town boundary without telling anyone that's happening. Ask the new Council to stop this Plan now, and instead stick with its already-adopted Settlement Strategy. By the way, this doesn't just affect people near the investigation area - plans to divert traffic through Carlsruhe and hinterland areas around Kyneton affect people who don't even know it, and then there are the people who shop in Kyneton as well. * Amendment C99 was approved by the Minister for Planning last Thursday, June 15 2017. The amendment was intended to implement the Kyneton Structure Plan’s recommendations into the Macedon Ranges Planning Scheme. Feeling suckered? You should be. There is no justification or need to investigate or rezone any more land in Kyneton, and definitely not on this scale. The changed town boundary is a slippery deviation, slid in when it was thought no-one would be looking. Maybe someone thought it worked with C99, let's try it again. There was apparently an Issues and Options Paper before the Framework Plan which seems to have been something done in-house, based on information provided by council and the State government. Anyone out there remember the community being consulted on this? We strongly suggest you don't go along with council's survey or its submissions form. Just write a page of comments saying what you want to say - not what council wants you to say. Try to avoid falling into the trap of looking at the features of the plan - you only get those with this much growth: the biggest issue is that this type of growth is happening at all. The Kyneton South Framework Plan is a project started under the previous council, not the new one. This is an accelerated growth agenda that has been characteristic of the current administration and the previous council, and not just in Kyneton. For example, last Thursday approval of Amendment C100 gave Riddells Creek 250ha of new residential land when the Riddells Creek Structure Plan said around 50ha was needed in response to the Settlement Strategy population projections for that town. It is not acceptable to change town boundaries without a comprehensive consultation process, AND a very sound strategic justification. There is no justification or need to investigate or rezone any more land in Kyneton. Why are resources being wasted on attempting to add more residential zoned land at Kyneton? It seems to be a case of “build it and they will come”. The Framework Plan’s discussion is notably absent on costs, and environmental details, and projected lot sizes / densities and the population it could accommodate – amongst other things. What it does do is identify a frighteningly large amount of infrastructure – bridges, new sewerage treatment facility, new roads and town bypasses, etc. – without costings or even feasibility. It is grossly premature, and incomplete, pre-empts agreement or even discussion with community, and is excessive to the Shire’s Settlement Strategy for Kyneton. It’s not asking people what they think, it’s telling them how it will be done. There can be no logical or rational answer to the question “why”? Growth as proposed in Kyneton puts the Settlement Strategy’s growth plan for the entire Shire out of balance. There is no regard to the protection being introduced by the State government. This includes a requirement to protect, amongst other things, landscapes. The township boundary shown in the Kyneton South Framework Plan encompasses landscapes identified in the Kyneton Structure Plan as important, providing a rural backdrop to the town and particularly the Botanic Gardens, and warranting specific protection in the planning scheme (council declined to introduce any such protections in Amendment C99, saying what was there (e.g. Farming zone) was enough). Legislation is proposing to protect “settlement boundaries”, requiring parliament’s approval to change them. This project could be seen as potentially pre-empting any process or consultation to set those settlement boundaries. 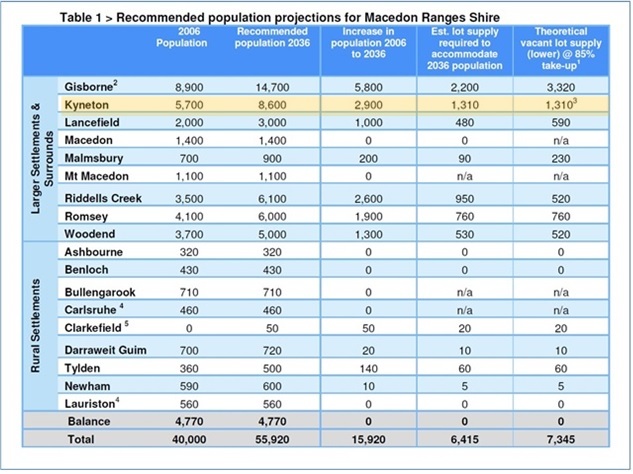 Council’s official population growth document, the Macedon Ranges Settlement Strategy 2011, says Kyneton could grow by 2,900 persons between 2006 and 2036 (or around 100 persons a year over 30 years), and this growth could be accommodated within the town without rezoning any additional land. The 2011 census shows Kyneton township grew by 174 people between 2006 and 2011 (let's be generous and round that up to 40 per year). The Macedon Ranges Settlement Strategy used Study Areas that were bigger than the towns to count population, and included the towns and all Low Density and Rural Living zoned land around them. The population in Table 1 below the Settlement Strategy's population and projections for the Kyneton Study Area which shows “Kyneton” with a population of 5,700 in 2006. Based upon the growth assigned to Kyneton in the Settlement Strategy, Kyneton was projected to have a population of 8,600 in 2036, an increase of 2,900 people. The Settlement Strategy determined there was sufficient existing unconstrained land supply to accommodate 2036 growth without rezoning any new land. This included some medium density development within 400 metres of the town centre i.e. High and Mollison Sts. The Settlement Strategy established a hierarchy for all settlements in the Shire. Kyneton was defined as a “District Town” (between 2,000 and 6,000 persons) in 2006, and was projected to grow to a “Large District Town” (6,000 to 10,000 persons) in 2036. Although the town of Kyneton had 4,460 persons in 2011, council has used ABS Kyneton State Suburb population of 6,629 in 2011 (which includes part of Mount Alexander Shire), which mis-represents and inflates the town's population. Based on this, Clause 21.13-2 in Amendment C99, now in the Macedon Ranges planning scheme, prematurely elevates Kyneton to “Large District Town” status in 2011. The Structure Plan affirmed the Settlement Strategy’s findings for population growth and no further land being required, but then made a recommendation that an investigation area (the same area now being investigated) be identified to ensure 15 year supply of land. The Structure Plan set requirements for such future investigation, as below. The key focus of the Kyneton South Framework Plan seems to have skipped over the basics of soils, environment, agriculture, landscapes, and leaps straight into what would be needed to support the growth proposed. The Kyneton Structure Plan merely identified the Kyneton South area for future investigation. Amendment C99 accelerated that and put timeframes for development on the investigation area, saying sufficient progress in investigations had occurred to do this. When asked by MRRA to produce the investigations that had occurred, Council said the investigations had been done by landowners.